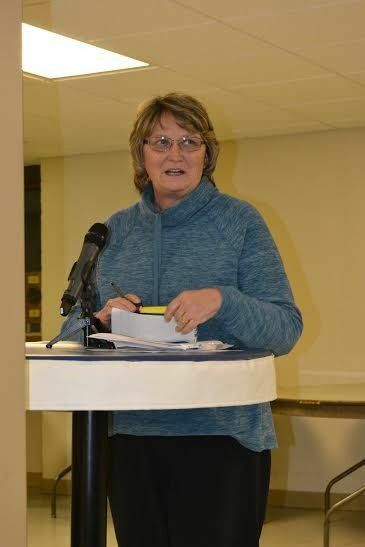 Dixie Meyer, a Park Hills landlord who asked to be allowed to speak to Park Hills City Council at its meeting Monday night, was warned as she stood up to speak that neither the mayor nor the council would answer any of her questions. City Attorney Todd McMurtry told Meyer that she could submit her questions in writing and the city would answer the questions that way. He said the city already stated their position. "You say we are not allowed to rent to felons, or anyone convicted of violence or drugs," Meyer said, after her initial surprise at being shut down. "If every city passed an ordinance like this, where would these people go?" She paused, listening to the silence. "This is ludicrous that I can't get any answers." Meyer, a member of the Bromley City Council, is one of several landlords in the city affected by a so-called nuisance ordinance passed by council at the January meeting as an emergency ordinance, meaning that it would only need one reading before a vote was taken. McMurtry said that the city had been working on the nuisance ordinance for a little while, and Fire Chief John Rigney came to the January meeting and told council that the roads going to certain buildings were impassable right now for any fire vehicles, because they were in such bad shape. When they heard this, Council felt they should pass the nuisance ordinance on an emergency basis, and they did. The 22-page ordinance, which is on the Park Hills website, deals with several specifications of nuisance offenses for which the city will cite, most of it, according to McMurtry, similar to what other cities have. The ordinance specifies that landlords can be held responsible for offenses committed by their tenants and spells out that the landlords can protect themselves by enacting stronger screening procedures for renters, including prohibiting renting to anyone who has a felony, or a record that would include drug offenses or any kind of violent offenses. McMurtry indicated after the meeting that the city can't punish landlords for renting to whomever they want, and the information in the ordinance is not necessarily new. He did not want anyone on council to be drawn into an argument at the meeting, which is why he told Meyer no one would answer her questions there. "She has been up here before several times, shaking her fist and causing arguments," he said. No one with a felony can rent in Park Hills? Ever? Current tenants need to move? No one with a conviction involving drugs and violence can ever rent in Park Hills? Again, ever, and does it affect current tenants? Landlords are to use city-approved screening vendors, but who are they, and if these vendors are required will the city pay for them? If not, can the police run the background checks free of charge? Currently section 8 does background checks and the renter must meet the guidelines set out by HUD, so is that OK? Are clients referred by the North Key community services, or the Cincinnati Veterans Association program acceptable? McMurtry was prompt in responding. He said the city could not provide free background checks to private businesses, but any screening process vendors that are licensed in a state in this country and regularly do criminal background checks are approved by the city. As for who may rent, McMurtry said, "As you know, the City's attorneys do not represent you and cannot provide you with legal advice." As clarification, he said, "Please know that landlords can rent to whomever they want. The city's nuisance ordinance does not place any restrictions on who may enter into a landlord/tenant relationship." He went on to advise that if there are any other questions, they can consult an attorney familiar with municipal law. When asked, he said that loss of a license to conduct business in the city was not a consequence of the nuisance ordinance. Meyer did not get all her questions answered. "I don't know what you want of us," Meyer said to an unresponsive council as she left to sit down. "I want to tell you that this is the most anti-rental city I have ever known. With all due respect, you should give someone guidelines so we can obey your rules." Other citizens who came to speak at the meeting were there because of the road widening project scheduled for Altavia Avenue. The road has to be widened to 22 feet because that is the minimum width to allow fire trucks to be able to traverse the road. Currently the road is very narrow, but the lots on the street are only forty feet, so front yards are already very small. The current plan, which has been tweaked a few times according to council and is to have a sidewalk only on one side of the street, and public off-street parking. (An earlier version of this article suggested that there would be private off-street parking pads as part of this plan but that is not correct and the story has been updated.) Several meetings have been held on the subject of widening this road at which the residents were able to voice their concerns. One resident felt it was not fair to take a sidewalk from one side of the road because he will have two children who regularly walk down to their grandparents' house, and will now have to cross the street to walk on a sidewalk. He determined that the residents who had the loudest voices received what they wanted. Council member Kathy Zembrodt disagreed. "We didn't change the plan for any individual," she said. "There was not enough parking. The plan did not include parking pads and now it does. We are hoping it is a happy medium and it will be a safe, nice street." Mayor Matt Mattone agreed, saying that the city worked diligently to be fair. At the end of the discussion, council eventually voted on a motion to go ahead with the widening project as it stands, with the provision that they could make small changes to the plan as it evolves. The motion was pushed through so that the project would have a chance of being done this year. Councilman Steve Elkins was the only dissenting vote. Joe Meyer, a candidate for Covington Mayor and head of the anti-toll coalition Northern Kentucky United, came to discuss the Cincy Eastern bypass, an alternative route running 62 miles from right around the I-71/I-75 split in Kentucky to a point near Franklin, Ohio, proposed by a home builder as an alternative to the Brent Spece Bridge project. Meyer is advocating for a study to be completed by the governor's office to see if the proposed bypass would be a feasible alternative to building a new bridge next to the Brent Spence by taking 25 percent of the traffic off the bridge. Council said they would discuss passing a resolution showing their support for the study, and decide on the matter at next month's meeting. Meyer had previously sought support from Erlanger City Council last week and recently urged Northern Kentucky legislators to support his efforts, too. Council passed an ordinance authorizing funds from the Tree Board Reserve fund to be placed in the general reserve fund for payment for several trees that were already planted. All voted in favor. An ordinance which will separate the Code Enforcement Board from the Nuisance Board was introduced to council and will have its second reading in March. Council appointed Councilman Monty O'Hara as a representative to Planning and Development Services (PDS), and Councilwoman Pamela Spoor as an alternate. Council also passed a resolution approving the mayor to enter into an interlocal agreement with the city of Ft. Wright to provide EMS services for a two-year term at a modest increase of $600 per quarter.